The task list is used to view and manage your tasks. 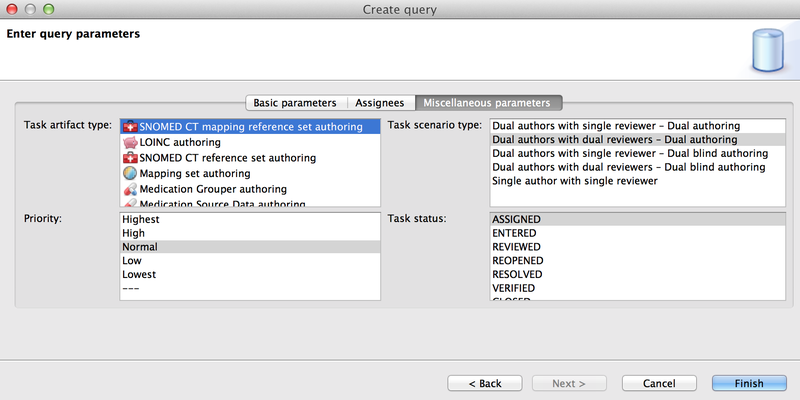 You can create your own queries to group the tasks according to your needs. We'll discuss using queries to organize your tasks in a later section of this chapter. Double-click on a task in the task list to open the task editor. To activate a task, click on the circle in front of the task title. 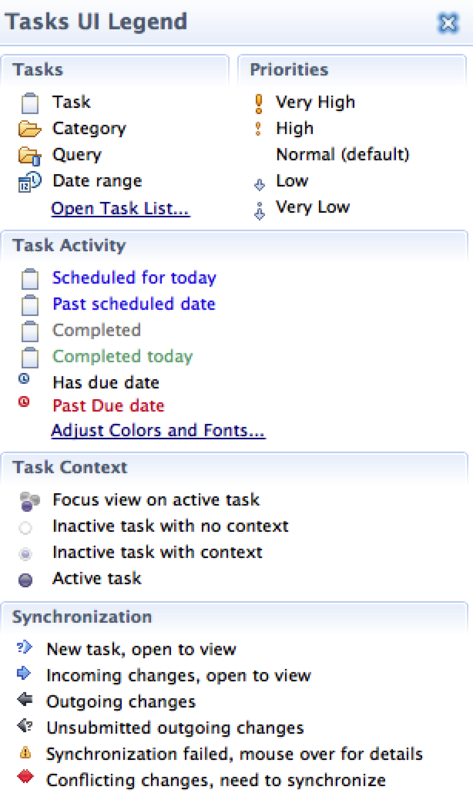 Active tasks are indicated by a purple circle, the task title is displayed in bold font. 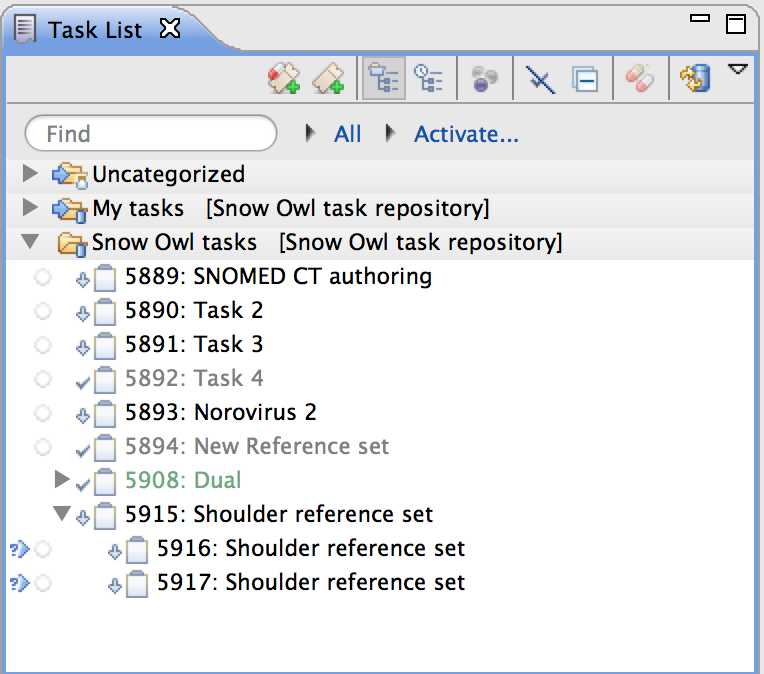 Tasks with two authors are displayed as a parent task with two subtasks. To see the subtasks, click on the triangle to expand the parent folder. : Snow Owl task: Create new Snow Owl task. : SDD task: Create new SDD task. Generate batch: This applies only when working with the SDD. Synchronize: Update repository tasks with changes from the shared server. Click on the triangle next to the icon to open the context menu. The text field allows searching for a task by name, ID, or terms from the task summary. It's useful to pay attention to the small icons in front of the tasks. They are related to actions that can be performed (e.g. activating a task), or give information about the task (e.g. high priority). The color of a task also provides useful information (e.g. tasks scheduled for today are blue). To access the Task UI legend click the small triangle next to the Synchronize icon in the toolbar, and select Show UI Legend. Note: If you are working with Windows, completed tasks are crossed out. You can use queries to organize tasks according to your needs. When you create a query, a folder will be added to your task list that contains only the tasks that meet your search parameters. Once you've created a query, you can update results by pressing the synchronize button . This way, you will always keep up to date with the tasks you are working on. Then select the repository you would like to use and click Next. Select Create query using form and click Next. 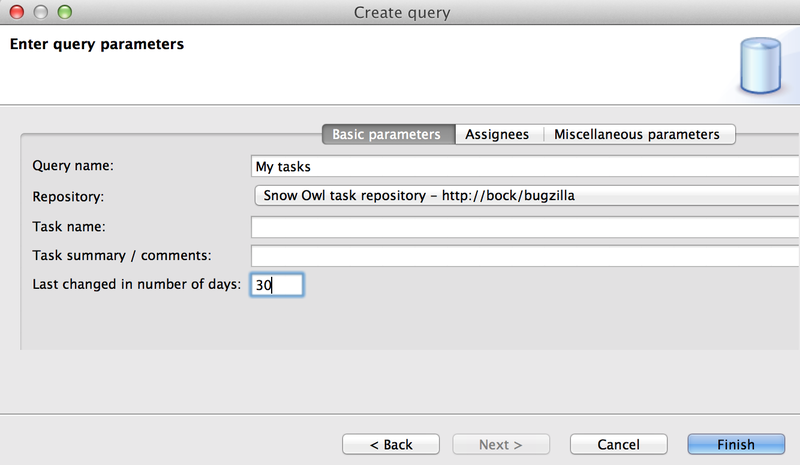 You can also bring up the query form from the the main menu: Go to File > New > Tasks > Query. 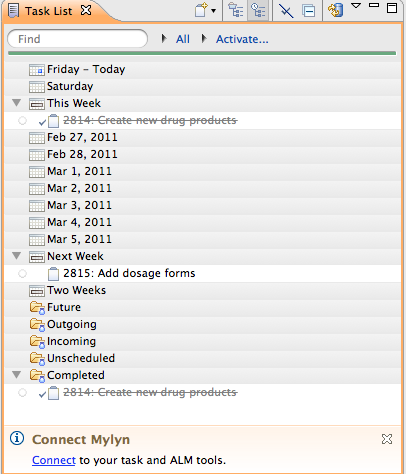 The query form defines which tasks will be downloaded and displayed in the task list folder. You can specify different parameters as necessary to filter the query results. The form is separated in three tabs: Basic parameters, Assignees, and Miscellaneous parameters. On the tab with Basic parameters, you need to specify a name for your query and select the repository. Query name: Enter a name for your query, which will be used as the folder name in the task list. Repository: Verify that the pre-set repository is the one used for task management (e.g. Bugzilla). Task name: Query for the name of a task (or part of the name). Task summary/comments: Query for terms from the task summary or the comments section in the task editor. Last changed in number of days: This is useful to restrict the query to more recent tasks (e.g. last 30 days). In the Assignees section you query for users, it aligns with the Assignees section in the task editor. You need to enter the user name which is used in the task management system, in most cases this is the email-address of the user. If you want to create a query for all the tasks that you are assigned to simply enter your user name in the query fields for Author one, Author two, Reviewer one, Reviewer two, and Adjudicator (see screenshot). If you want to follow up with the tasks that you created, enter your user name at Reported by. Author one: In case of a single author scenario, you need to specify the name of the author here. In case of a dual authoring, this is the team member assigned as the first author. Author two: In case of a dual authoring, this is the team member assigned as the second author. Reviewer one: In case of a single reviewer scenario, you need to specify the name of the reviewer here. In case of a two reviewers, this is the team member assigned as the first reviewer. Reviewer two: In case of a dual authoring, this is the team member assigned as the second reviewer. Adjudicator: This is the team member that is specified as the adjudicator in a scenario with two reviewers. Reported by: User who created a task. Priority: For example, display only tasks that have a high priority. Click on an item to select it, hold CTRL/CMD to select multiple items, or to un-select an item. If no items are selected, all parameters are included in the query. You should refresh the available parameters if the project structure on the task repository has changed recently. Once you have set your specifications, click "Finish" to start the query. A new folder for your query will be displayed in your task list. To make changes to an existing query, right-click on the query folder in the task list and select Properties. This will bring up the query form where you can make changes. Hit Finish to execute your new query. It's also possible to clone a query. Right-click on the query folder, and select New > Clone query. The query form has the same specifications as the selected query. To delete a query, right-click on the query folder, select Delete from the context menu, and confirm the dialog. This will remove the query folder. Scheduling your tasks can help keeping up with due dates and organizing tasks based on time restrictions and priorities. The scheduled date is the date you plan to start working on the task. Scheduling tasks is optional, it's a way to group your tasks based on a schedule, but not a precondition for working on a task. Scheduled tasks are private to your work space, your team members won't be able to see your schedule. Day: You can schedule a task on a particular day of the week. Pick between Today or for one of the upcoming six days. Week: If you are not certain on what particular day you can work on a task, you can schedule it This Week, Next Week or in Two Weeks. Date: A small calendar allows you to pick a particular day for a task. This might be useful if you already know when you want to work on a task in the future. Not Scheduled: By default, all submitted tasks are not scheduled. If you chose Not Scheduled the previous scheduling will be deleted. To schedule your tasks in the task list, right-click on the task to bring up the context menu, choose Schedule for, and pick an item from the list (see screenshot below). To see the upcoming dates along with the assigned tasks, their due dates, or desired completion times, click on the Schedule button in the view's toolbar. The tasks are organized in folders based on the different scheduling options (e.g. Thursday, This Week, Unscheduled) has. Use the triangles to open and close the folders and see your tasks. Since the scheduling is private to your work space, it's not necessary to submit your changes to the repository. Tasks with a schedule date in the past will appear in the Today folder. If you change the schedule of a task (e.g. 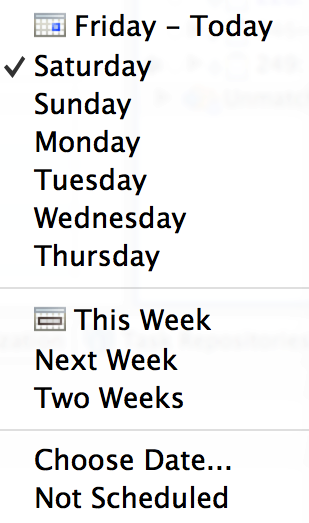 from Today to Next Week), it will be moved to the respective folder in the task list. Activated tasks appear in bold words. Inactivated tasks appear in normal font. When a task reaches its scheduled date it will turn blue, indicating that the task should be activated and worked on today. Completed tasks are crossed out. This applies to "Resolved fixed" and also to "verified" status. 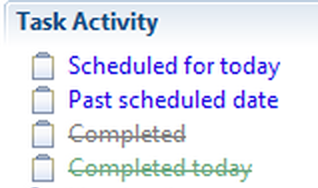 Green font indicates that a task was completed today. Grey font indicates that it was completed in the past (but not today). 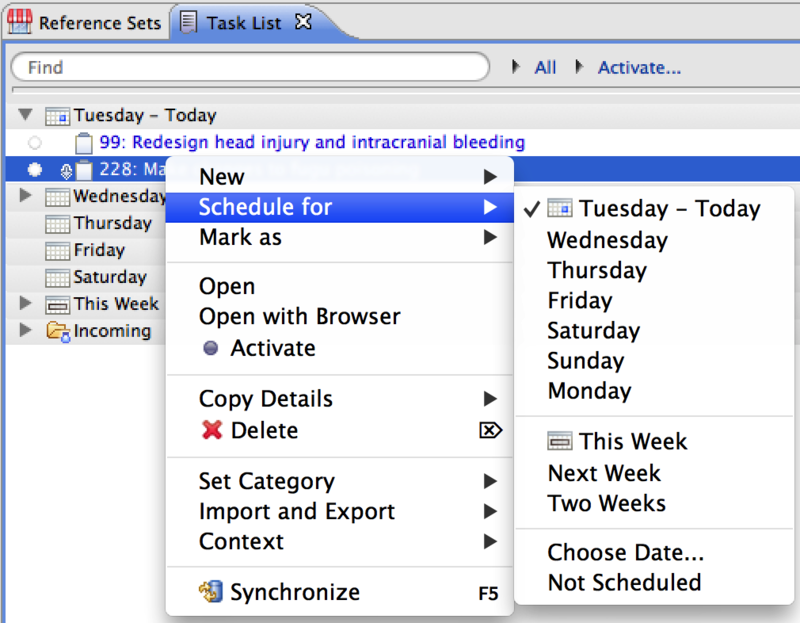 Click on the Focus on Workweek icon in the toolbar to see the tasks that are scheduled for the next seven days. In this mode, unscheduled tasks or tasks that are further in the future will not appear.